As we gather around the table and feast on our favorite dishes for the holidays, dessert is always on my mind! I guess through all the years of watching my aunts make their favorite cookies, I got hooked on the experience and the time I spent with each one of them. That’s when the kitchen became my quiet place. Cooking in the kitchen was never rushed. I remember the many lessons that were taught to me. All the ingredients measured out perfectly beforehand went along with the hours of small talk throughout the day. I felt important and valued participating in the baking process, as I carefully measured out cups of flour and ingredients for my aunts. It was mostly an all day affair, never giving in to the holiday shopping frenzy. To this day, I try to measure and mix by hand as they did. The process of baking is just as calming to me today as it was back then for me. Hopefully, I will pass down my love for baking to my children, nephews, and nieces so they may continue enjoying the many family recipes, we have gathered over the years. When I was in Greece, this cookie is more like a bar than a cookie and became the main snack as we traveled around the city from house to house. For many years my mother returned from her trips, with these tightly packed in her suitcase for us kids. They were wrapped in wax paper to be devoured in a couple of bites. 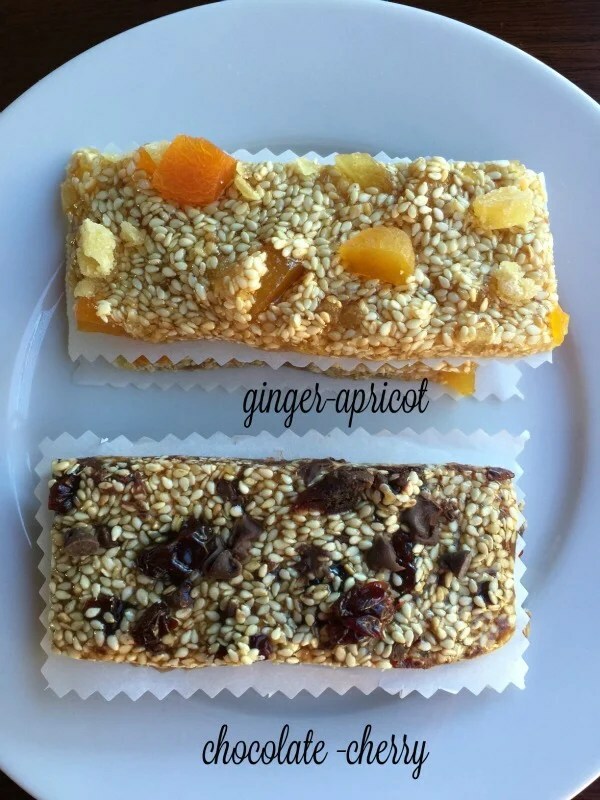 These can be made without all the additions of dried fruit and sweets. Just follow that directions with just the honey and seeds. I wanted to add new flavors to mine for a new California twist! Place on tray to cool. Stir gently to hard-boil stage. Pour onto silpat or parchment. 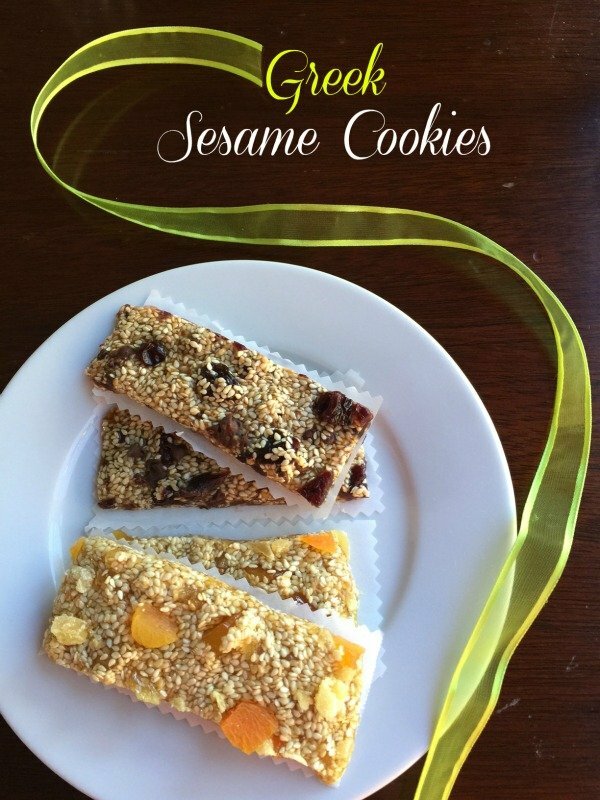 Try this lovely delicate sesame bars for your holiday table and enjoy them with a hot chocolate or cup of freshly brewed coffee. Toast the sesame seeds in a 400 degree oven for 10 minutes. Or place in a frying pan and toast on medium heat until golden. Combine the toasted seeds with the honey in a heavy saucepan and bring slowly to 280 F (light crack stage) on a candy thermometer. This takes around 10 minutes and the mixture should be golden brown. Be careful not to burn. Optional: Add the flavor of your choice and stir gently, keeping a few pieces topping. Pour the mixture onto a large silpat or buttered pan. Flatten with a wooden spoon to ¼- 1/2 -inch thickness. Cut into bars with a sharp knife about 2x4 inches and allow to cool. 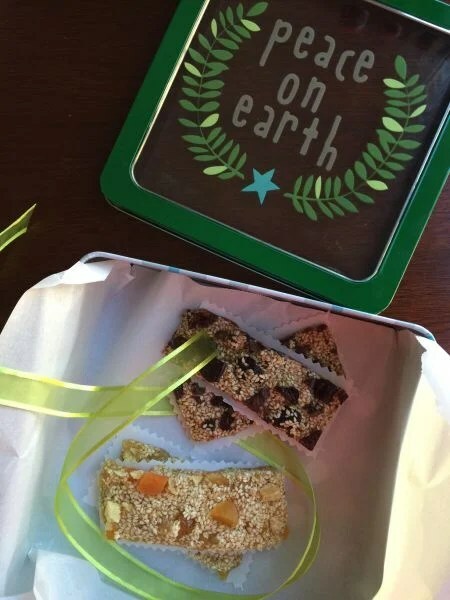 Wrap individually or store in wax paper.. The flavors are optional. Continue with the recipe with the honey and seeds for a traditional cookie. These look wonderful!! I so love sesame seeds and the little additions sound yummy. I’ll make them this weekend to have on hand for guests. Thanks, Mary! Let me know how they turn out! Watch the temperature because they are easy to burn.